Quick note.. shortly after I posted this story my husband decided Skippy was more appropriate than Zipper… so her name has been changed! Well, we’re back to Zipper… for some reason we Skipper/Skippy just didn’t work for her! Let me start by the beginning. 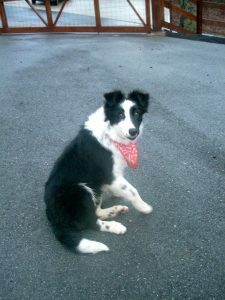 Early December I noticed that my neighbor down the hill had acquired a Border Collie puppy. This would seem appropriate for him as he deals in cattle. Buying, selling, transporting… so using the talents of this kind of dog was natural. He had her in a 4 x 8 pen that held a doghouse & a bucket of water. About a week after I noticed the puppy there, I also realized that I never saw Randy take this little dog out. At this point, I’d stop & visit the puppy every morning on my way to the barn. I really couldn’t drive by without stopping… she’d sit between her dog house and the side of the pen and very submissively bark & wag her tail. She had ample shelter but didn’t have a view of anything until whatever it was would pass in front of her. 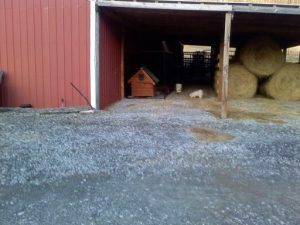 On her right was the barn wall and on her left was round hay bales. All she could really see was my driveway. It was tearing me up to see this beautiful little dog confined this way. 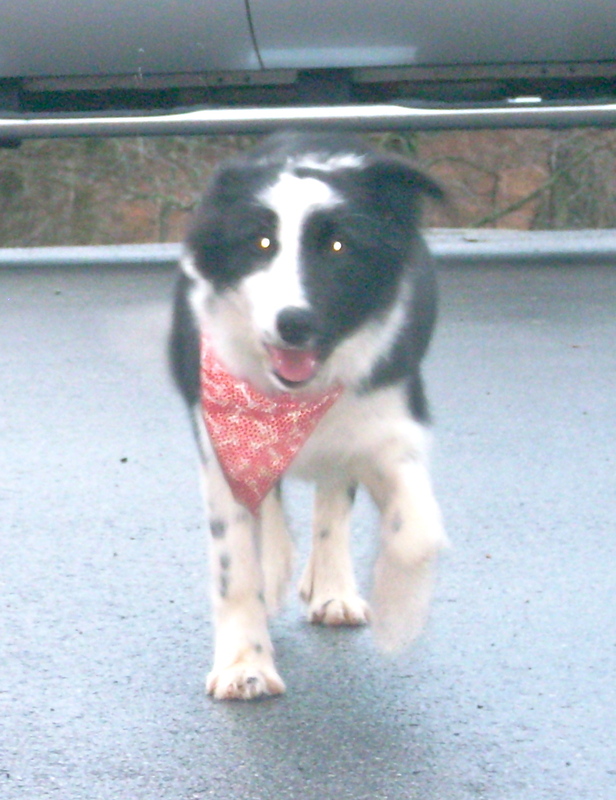 Border Collies are extremely high energy dogs and are meant to work. One of this dog’s mission is to please humans. She had no company whatsoever. Mouse would occasionally make it down the driveway and check her out but that was it. Just before Christmas I called Randy & briefly talked about his dog. His comment was that she had food, shelter & was not mistreated therefore I shouldn’t worry about her. He just couldn’t understand that dogs need more. I finished the conversation by saying that if ever he wanted to part with her, I’d be happy to help him find her a good home. He responded by saying, “No of course not… I just want to find out if you want her. I’m having to move and I can’t deal with a dog at this time”. I was flabbergasted! I really didn’t want another dog. Dealing with Mouse was tough enough… a Border Collie? Not sure I wanted to sign up for a 15 year contract again – especially so soon after Sheba had just passed. What was I to do? There was no way this little dog could stay there! So I said I’d take her! She spent her first day inside the barn area but when I returned the next morning, she was so happy to see me that I just couldn’t leave her by herself. We decided that if she was a “good girl” she could share the house with Mouse, our Bichon Frise. And what a joy she turned out to have around! She’s a smart dog she is and such a quick learner! For her first night I tied her on a short leash to the dresser next to my bed. Besides moving around a lot, she was relatively quiet. I can’t trust her loose – she has a tendency to get “chewy” – if I catch her in the act, a stern “No!” has her stop immediately but if I wasn’t there, that item would be totally destroyed. Her and Mouse get along well enough. Zip wants to play and Mouse doesn’t quite know how to respond to this overly excited, yappy and brave little dog! They have moments where we either have to scold them or just send them outside. Scott & I are happy she is with us. So what’s another extra muzzle to feed? In the big scheme of things, it doesn’t really matter. This beautiful dog needed a good, loving home and she found that here with us. It also makes me very happy to see that Zip is as attracted to Scott as she is to me. The first day she was here I thought this dog would never leave my side but she has adapted well and knows her rank in the pecking order with the other dogs. Now if Mouse can just stop squeeking! The funny thing about the addition of this new dog, Mouse has become a little more attached and loving towards Scott & I. Until the arrival of Zip, Mouse would spend most of her day (and evening), outside with the Mastiffs. It’s like she preferred their company to ours. Now she’s always with us. Yesterday Zip’s crate came in and she spent the night in it. I heard her whine a little but she calmed down very shortly after all the lights had gone out. Her crate is not in our bedroom (neither is Mouses’), and I was afraid that she might be a problem – her first night in the crate.. it could have been ugly! But it wasn’t.. she was the perfect little dog! I’m amazed at how quickly she learns and how delicate she is with us. She always comes when you call, practically sits on your feet and gently lifts her front paws.. but oh so gently, and sort of stands against you. I know I shouldn’t allow it but she’s so gentle about it! Her favorite toys are my old pink plush slippers! 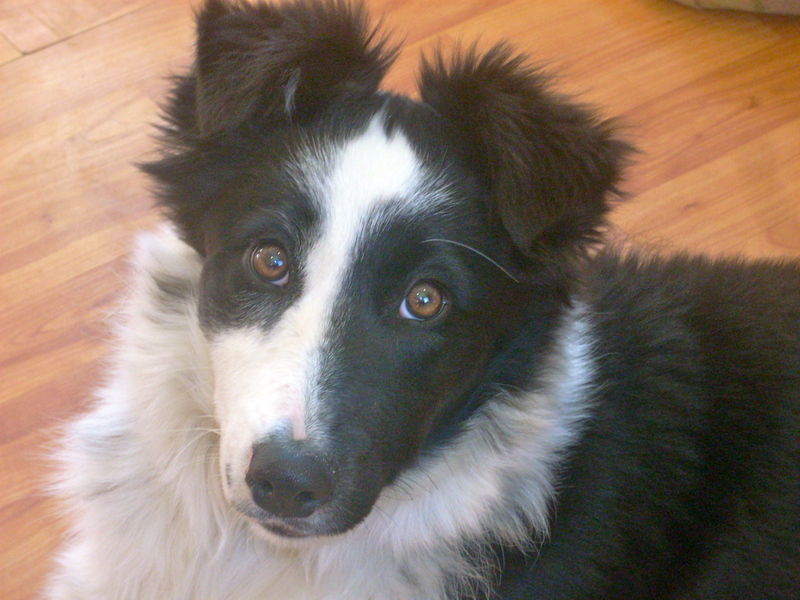 At this point, the most difficult issue to resolve with Zip might never be resolved because of her natural herding instinct. She loves to come to the barn but absolutely cannot resist chasing/herding the goats! She scares them nearly to death! A few bigger goats like Annabelle & Noelle aren’t impressed but the little ones just run and run. Zip doesn’t even try to touch them.. it’s just about making them move! I’m trying to keep her on a leash at my side while I tend to the goats but it’s not easy, not to mention that Zip is just so excited about it all! I’m going to have to look into the special training she’ll need to make barn visits easier on the goats, and ducks, and chickens, and horses, and llamas! Zip will try to herd/chase anything that moves when she approaches! We’re very happy with this lovely dog & I’m sure she’ll be with us for many more years to come! So, this is a God given glimpse of what my daughter, Hannah, will be as a beautiful, kind, loving farm girl all grown up. I see MANY resemblances already, and I have to admire that you two are so alike. She has found a Kindred Spirit in you, and I can assure you, she’ll be just like Zippy- a loyal, life long friend with energy to herd! lol You are a delight to my soul, A rare treasure! Keep being you, my friend! You are so lovely! Amber, thank you for the kind words! I know you’ll continue to encourage your daughter to fulfill her dreams! Mine came late, but they came! And what a great mother she has to encourage her to do what her heart desires! I feel blessed to be able to participate in Hannah’s passion! Don’t you wish our daughters would always stay “little girls”? Mine is a beautiful, successful 31 year old woman but in my heart, she’s still my little girl! Continue to enjoy Hannah’s innocence & inquisitiveness…God bless! It is amazing how much Zip looks like Daisy. Both have white between their eyes and mine is a dark liver color. Daisy also has the white chest and legs with gray freckles. Daisy is (also) a starer and wants to herd everything including us if possible. I know she will bring all the love and joy into your home that Daisy brings in to ours. Thanks Rhoda! Zip is an amazing dog & I’m happy she’s found a home with us.. we just have to learn to adapt to all that energy!